Gamers are oftentimes vulnerable to a myriad of health disorders that result from bad posture while sitting and playing their favourite games. I used to struggle with lower back pain when I was using a standard task chair – not only did it lack the padding I needed to stay comfortable, but also the adjustable settings that make gaming chairs so convenient. The AKRACING Premium V2 Gaming Chair proved to be a great choice due to the many adjustable features it had, not to mention that since it’s been specifically designed for gaming, I didn’t even felt like squirming for a different position while seated. 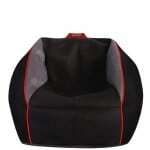 I will be sharing my experience using the AKRACING Premium V2 Gaming Chair below. To start off the list of benefits, I must admit that the AKRACING Premium V2 Gaming Chair is very impressively designed – clearly for gamers with a shift towards racing games. The classic combination of black and silver give it a slightly luxurious look, whilst the embroidery on the head of the seat and bolsters add a nice touch to the design. I was expecting a chair that half looked like a racing chair, but the actual design of this AKRACING gaming chair was beyond stunning. Although the AKRACING Premium gaming chair ships partially disassembled, you should be able to quickly assemble it in about 10 minutes. The seat is put together with upholstery copper clips, similar to an expensive car seat, and the stitching looks of high quality, not shoddily thrown together, as I’ve seen in several other models that I’ve reviewed. But what really impressed me about this AKRACING chair were the screws and washers, which were actually pre-threaded into their proper locations to save you the time you’d need to figure out which is which. What’s more, there is also a relief cut between the two bolts, which provides relief to the fabric to prevent tear. The armrests are already attached to the chair, which is a great thing in my point of view. 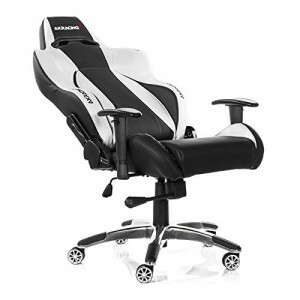 The AKRACING Premium V2 Gaming Chair ships with two pillows that aim to enhance comfort – the bigger one with straps has been designed to provide support to your lower back, whilst the smaller one with elastic strap offers support for your neck and head. They’re extra cushioned, which obviously makes them really comfy. 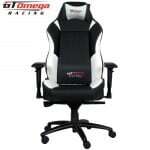 Paired with the padding of both the seat and backrest, I can proudly say that this gaming chair is revolutionary. Although made of plastic, the wheels rolled pretty smoothly even when I was seated, and – surprisingly – they didn’t leave any nasty scratches on my floor, so another big plus. One last thing I liked was the range of adjustable settings: backrest height, height of the armrests, backrest angle, and rocking function. 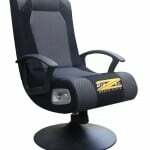 The chair accommodates anyone with ease, and the adjustable settings make it possible to adjust the seat so it provides maximum comfort to anyone sitting in it. Now for the cons – I wasn’t as pleased with the paint on the wheels, which was a bit messy and rather unpredictable. This was hard to notice from a distance, but clearly visible to me when I was assembling the chair, making me wonder what the thought was here. The PU leather upholstery was also quite disappointing. I expected it to be thick and durable, but Toby managed to eventually puncture it with his claws. Now I need to keep him away from the chair unless I want to have the upholstery damaged and the look of the chair – completely ruined. If you have cats that sleep with you and spend a lot of time in the same room as your gaming console, then you may want to consider a different model. The armrests aren’t padded, which made my elbows really painful after just one hour of gaming. Put more pressure on them while you’re holding the controller and you’ll end up using ice packages to alleviate the pain. 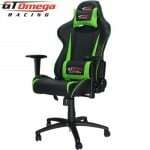 Despite a couple of drawbacks, I was very satisfied with how the AKRACING Premium chair performed. It was clearly designed for gaming, making it very easy for me to enjoy my favourite games while seated. 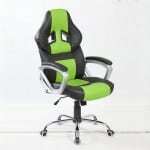 However, the chair might be quite pricey for those on a budget, as it costs about €309, the equivalent of £245. 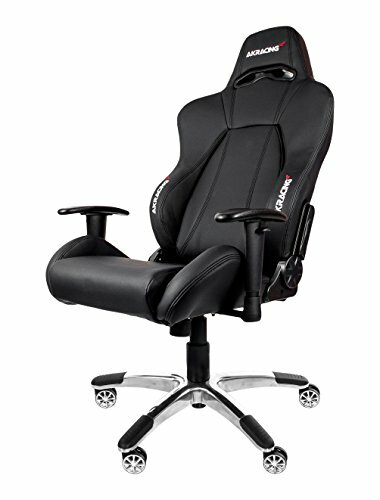 There are cheaper models on the market, so the AKRACING V2 chair can easily become more of an item on your wish list than your actual gaming chair!